Financial results for the first quarter 2017 came in below the previous-year period for Panalpina. The international freight forwarding and logistics company reported an EBIT of CHF 16.4 million (Q1 2016: CHF 24.0 million) and a consolidated profit of CHF 12.4 million (Q1 2016: CHF 17.3 million). Panalpina outperformed the air and ocean freight markets in terms of volume growth as margins remained under pressure. “In the first three months of the year, we succeeded in outperforming the markets with volume increases of 8% in Air Freight and 7% in Ocean Freight. As expected, margins remained under pressure, however, they are slowly recovering since we saw an upturn in unit profitability in both Air and Ocean Freight compared to the last quarter of 2016,” says Panalpina CEO Stefan Karlen. 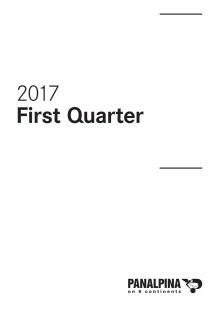 In the first quarter of 2017, group gross profit decreased 9% to CHF 332.7 million (Q1 2016: CHF 364.9 million), while total operating expenses were reduced by 7% to CHF 305.7 million (Q1 2016: CHF 328.7 million) year on year. Panalpina achieved an EBIT of CHF 16.4 million (Q1 2016: CHF 24.0 million), a decrease of 32% compared to last year’s first quarter. The EBIT-to-gross-profit margin came in at 4.9% (Q1 2016: 6.6%) and the consolidated profit of the group reached CHF 12.4 million (Q1 2016: CHF 17.3 million). Panalpina’s Air Freight volumes grew 8% in the first quarter compared to an estimated market growth of just above 6%. Volume growth was driven mainly by the Far East trade lanes. Gross profit per ton decreased 10% to CHF 620 year on year (Q1 2016: CHF 688), but was up versus the last quarter. Gross profit overall remained almost unchanged at CHF 144.7 million (Q1 2016: CHF 148.6 million). With an EBIT of CHF 17.1 million (Q1 2016: CHF 17.8 million) and an EBIT-to-gross-profit margin of 11.8% (Q1 2016: 12.0%), Air Freight kept previous-year profitability levels. Panalpina’s Ocean Freight volumes increased 7% year on year while the market grew by an estimated 4%. The Transatlantic and Far East trade lanes contributed to Panalpina’s growth. However, gross profit per TEU decreased 17% to CHF 282 (Q1 2016: CHF 339), resulting in a gross profit of CHF 105.5 million (Q1 2016: CHF 118.1 million). Quarter on quarter, gross profit per TEU increased. As in the last quarter, EBIT and EBIT-to-gross profit margin were negative with CHF -3.2 million (Q1 2016: CHF 4.3 million) and -3.0% respectively (Q1 2016: 3.7%), though both showed an upward trend. 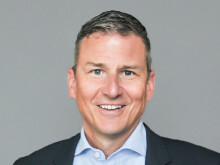 The exit from more underperforming sites meant that the gross profit of the Group’s Logistics product decreased 16% to CHF 82.5 million (Q1 2016: CHF 98.2 million), but with a strong end to the quarter and further improvements in underlying profitability, EBIT increased from CHF 1.8 million to CHF 2.4 million, resulting in the highest quarterly result recorded to date. 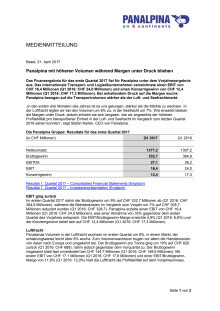 Das Finanzergebnis für das erste Quartal 2017 fiel für Panalpina unter dem Vorjahresergebnis aus. Das Unternehmen verzeichnete einen EBIT von CHF 16,4 Millionen (Q1 2016: CHF 24,0 Millionen) und einen Konzerngewinn von CHF 12,4 Millionen (Q1 2016: CHF 17,3 Millionen). Bei anhaltendem Druck auf die Margen wuchs Panalpina bezogen auf die Transportvolumen stärker als der Luft- und Seefrachtmarkt.